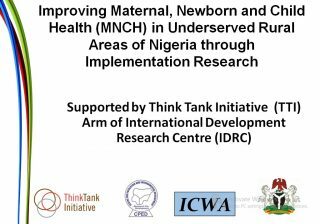 CPED research on access to Primary Health Care which was implemented in Nine Local Government Areas of Delta state and the research results of the MNCH project in Okpe LGA, Delta State, show that lack of finance reduces women’s use of maternal health services and keep millions of women away from having hospital-based deliveries or from seeking care even when complication arises. These has led many women to patronize the Traditional Birth Attendants (TBAs) in their localities, which sometimes result to more complications and even maternal and child mortality, whereas, the vast majority of maternal deaths and injuries in these areas could be avoided when women have free access to health care, before, during and after childbirth. On the other hand, WHO has lay bare that medical fees remain a major obstacle to healthcare coverage and utilization, and has advocated that government at all levels should engaged in risk-pooling prepayment approach as a major way to reduce reliance on direct payments for medical bills. 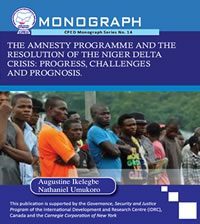 Although, the Nigeria government has started the National Health Insurance Scheme (NHIS) in 2005 to provide health coverage for Nigerians, less than 5% of Nigeria population are currently benefiting from this scheme, mostly from the formal sector, leaving the large population from the informal sector (majority of who are poor) not protected. 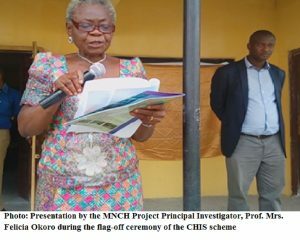 It is against this backdrop that the MNCH project team yielded to the recommendation of the Project consultant, Professor BSC Uzochukwu, to include Community Based Health Insurance Scheme as a key component of the MNCH project in Okpe LGA. 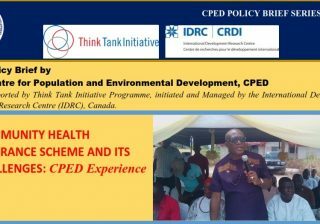 Establishment and implementation of Community Based Health Insurance Scheme was also one of the focal points in the communiqué that emanated from the special meeting of local policy makers held in Warri, Delta state in 2016 where CPED brought together these local policy actors from the 25 LGAs of Delta State to brainstorm and chart the part for a free maternal and under five health care service delivery in rural PHC centres in Delta state. 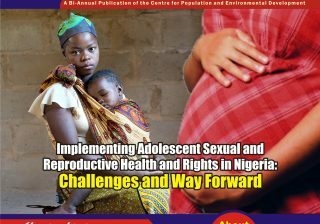 In order to promote ownership among community members, the MNCH project team adopted CPED participatory approach of involving key stakeholders in project implementation especially at rural community levels. 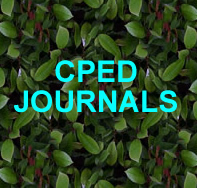 CPED recognised that participatory approaches generate political commitment, build ownership and create champions, ensuring that the issues raised are considered from multiple perspectives, and decisions are reached collectively about how to proceed in the specific local context. 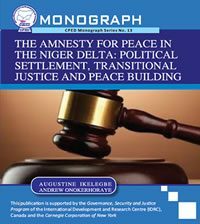 As part of preparation for the takeoff of the community health insurance scheme, the MNCH project team, therefore, held several meetings and dialogue with all stakeholders, including the authority of the Delta State MoH, the authority of the Okpe local government council, community leaders and groups including women groups and youth groups in the various participating communities, among others. 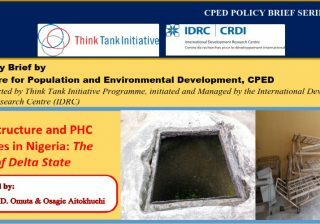 Although it took a longer time than expected to build the confidence of the community members, set up the machinery for the implementation of the scheme such as constituting the CHIS management committee, renovating the PHC facility where treatment and care will be domiciled, preparing necessary documentation materials, mobilizing community members to register for the scheme and the challenge of opening a bank account for the purpose of the scheme, the project team are glad that the initiative finally kicked-off and registered members have commenced receiving services. 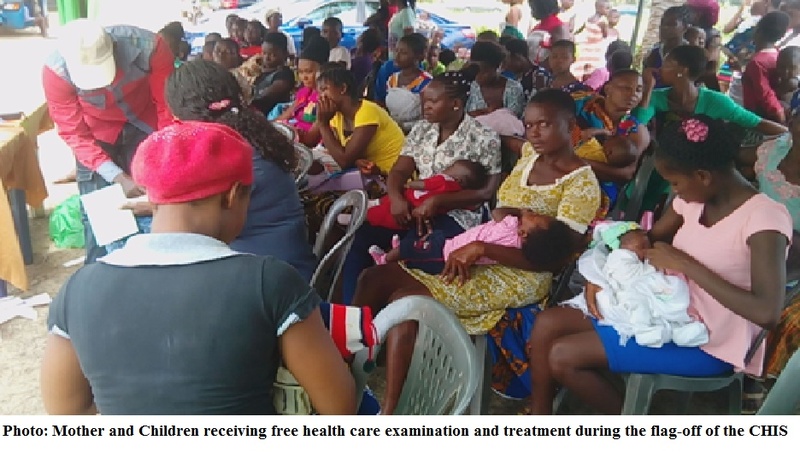 As noted before, the establishment of the Community Health Insurance Scheme (CHIS) using Okwabude Primary Health Care (PHC) facility as the treatment and care centre was among the key intervention components of the Maternal, Newborn and Child Health (MNCH) care project in Okpe Local Government Area (LGA) of Delta State. Although, registered members have long commenced receiving services, the project team saw the need to officially flagged-off the scheme so that other key stakeholders across the state can learn from the initiative and continue to reflect on possible scale up. 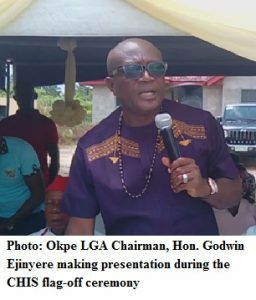 The occasion which took place in August, 2017 at Okwabude Primary Health Care centre, was witnessed by eminent personalities across the state- including directors and permanent secretaries of key ministries and agencies in Delta state, local government executives across the state, community members within and outside the project location, community leaders including women leaders, local NGOs, Advocacy groups, private investors, business owners, among others. Astounded by the caliber of personalities that attended the event, one of the community members who was yet to register before the flag-off ceremony, stated: “I thought it was a joke, but when I saw the big, big oga that came to attend this event, I now realized that CPED mean business…….. After this ceremony, I must register my family” he added. 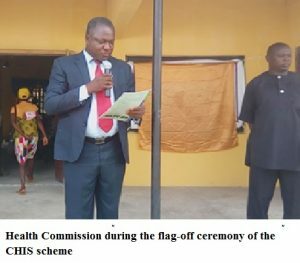 The CHIS scheme was officially flagged-off by the Executive Chairman of Okpe Local Government Area, Honourable Godwin E. Ejinyere alongside with his council executives members, including secretary to the local government (Hon. Jackson Olokpa), Okpe supervisory councillor for Finance (Hon. C. A. Royal), Okpe LGA supervisory councilor for health (Hon. Obire Shator Peter), Okpe primary health care coordinator (Dr. Isaac Mokuro), amongst others. The Chairman commended the project team for the initiative and pledged his support for replication in other communities in Okpe LGA following the model approach adopted by the project team. 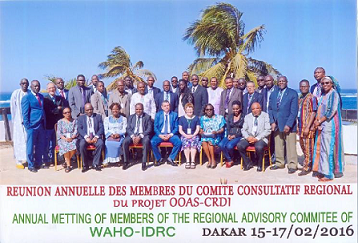 He further thanked participating community members for their understanding and willingness to care for their own health through this risk-pooling of funds to support health care service delivery at the community level. 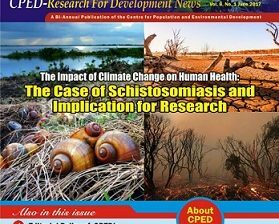 He however, lamented that, though health care provision is supposed to be government responsibility to the people, looking at the current economic crises Nigeria is facing, CHIS initiative is most likely a way out to achieve universal health coverage, he said. In his concluding remarks, the chairman appeal to those who are still skeptical about the scheme to allay their fears as the scheme has come to stay and that the more the number of people that are registered the more sustainable the scheme will be. The occasion also witnessed a presentation by the project trained volunteer Village Health Workers (VHWs) who in their usual style, thrilled the with a audience drama showcasing the benefit of registering for the community health insurance scheme and the need for mothers and pregnant women to visit the PHC centre and stop patronizing traditional medicine vendors, especially during pregnancy and up to delivery. 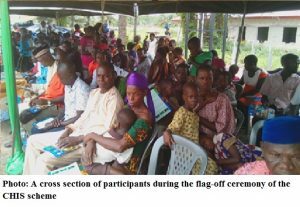 The event also provided opportunity for the project team in collaboration with Okpe LGA council through the Primary Health Care Department to offer a free health care and treatment for mothers, children and the aged ones who attended the event. Immunization commodities were provided, drugs were given for free and many referrals were made for complicated cases. Doctors and nurses were on hand to examine, treat and refer patients where necessary. 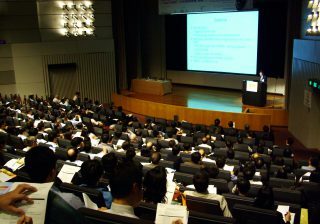 Many households signified interest to register for the scheme on that day. Although coverage is still low, the willingness and acceptance by majority of community members who registered and are very interested in registering for the scheme is a welcome development. 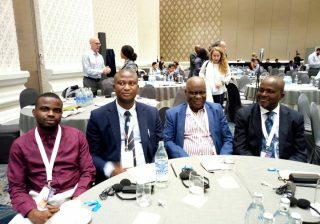 The MNCH project team recognized that the success of the CHIS and its ability to achieve its goals greatly depends on the sustainability of the program and the ability to scale it up. 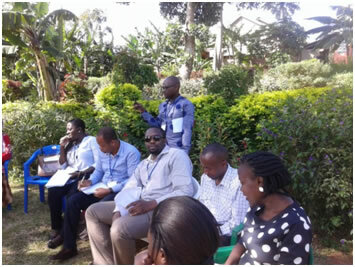 Ownership, political will, local leadership as well as motivation and building trust in the rural community members have been identified as a key factor for successful implementation of the CHIS. To this end, the revamped ward development committee (WDC), CHIS management committee and the volunteer village health workers will continue to mobilized and increased awareness among community members to register for the scheme, ensure quality services are provided and delivered in a manner that meets the needs of the healthcare users. This is necessary to build trust and confidence in the system and encourage beneficiary to continue to pay their premium. 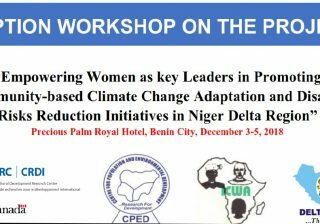 Again, even when the project is officially closed, CPED and its programme staff will continue to work to support the activities of the various committees at the community level to encourage participation, promote ownership and mobilize resources.